Looking for a Better Measurement Strategy? Discover why you need an integrated marketing & PR measurement approach. 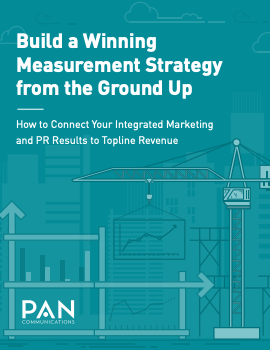 Download 'Build a Winning Measurement Strategy from the Ground Up' here! Segmented analytics get you nowhere. Today's CMO is faced with ensuring that their marketing dollars are aligned with overall business growth and revenue. But, at the same time, marketers aren't taking a holistic approach to their measurement efforts. It's time to stop measuring in silos and start looking at your entire communications strategy as a whole to make better business decisions. Integrated measurement is key to future success. Get started today. Are you ready for an integrated measurement strategy?